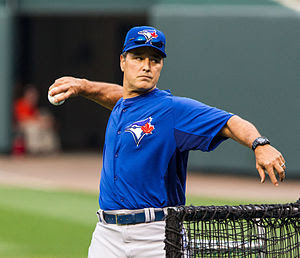 Don Wakamatsu throws batting practice for Toronto. He now scouts for the New York Yankees. Former Blue Jays coach Don Wakamatsu made his major-league debut as the catcher for Charlie Hough and his unpredictable knuckleball. 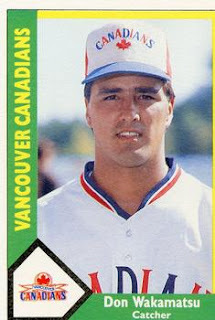 Wakamatsu was called up from the Vancouver Canadians in 1991. Don Wakamatsu's dream job proved to be every catcher's worst nightmare. The 28-year-old backstop ended a six-year apprenticeship Wednesday by playing his first major league baseball game. His unenviable assignment was to track a knuckleballer's unguided missiles. "It's a nightmare to get called up and have to catch Charlie Hough," Wakamatsu said yesterday, the day after his debut. "It's nerve-racking." Wakamatsu was plucked from baseball anonymity earlier this week, as the Chicago White Sox bought his contract from the Vancouver Canadians. It was just another among dozens of midseason roster moves, a bit of baseball paperwork noted only by Rotisserie devotees and a patient catcher's delighted family. For Wakamatsu, who was toting a humbling .127 batting average here, the unlikely promotion has temporarily put aside thoughts of retirement. "You play in the minor leagues for so long, you wonder if you're ever going to move up," Wakamatsu said before last night's game in Oakland. "Everything I touched this year went bad. You can't ever give up. Statistic-wise, when I'm playing my worst, I get called up. It's a strange game." Wakamatsu was promoted by the parent club after backup catcher Ron Karkovice tore a ligament in his left thumb. On his arrival, manager Jeff Torborg, a former catcher, tossed the rookie a glove as big as a ham hock with the warning he was to handle the notorious knuckleballer. Early in his debut, two elusive pitches corkscrewed away from him, one costing a run. Wakamatsu lined a single to right field in four at-bats in a White Sox victory over the California Angels at Anaheim. The ball was waiting in his locker after the game. Meanwhile, Wakamatsu hopes to learn more about his trade from first-string catcher Carlton Fisk, a future Hall-of-Famer. "He's been in the game forever, longer than any other catcher," Wakamatsu says. "He's got an aura around him. I try to pick his brain whenever I can." After a minor-league whistle-stop tour that included stops in Iowa, Florida, Montana, Alabama and Tennessee,Wakamatsu is enjoying the fruits of the major league minimum salary of $100,000 US. As well, Wakamatsu has finally read his name in a big league boxscore, even if it was shrunk to "Wkmts". His temporary job has won him a permanent citation in the venerable Baseball Encyclopedia. "Now, I can be remembered," he said with a laugh. "They say there's only one place to play, and it's the bigs, that's for sure." Didn't you used to be … Doug Ault? 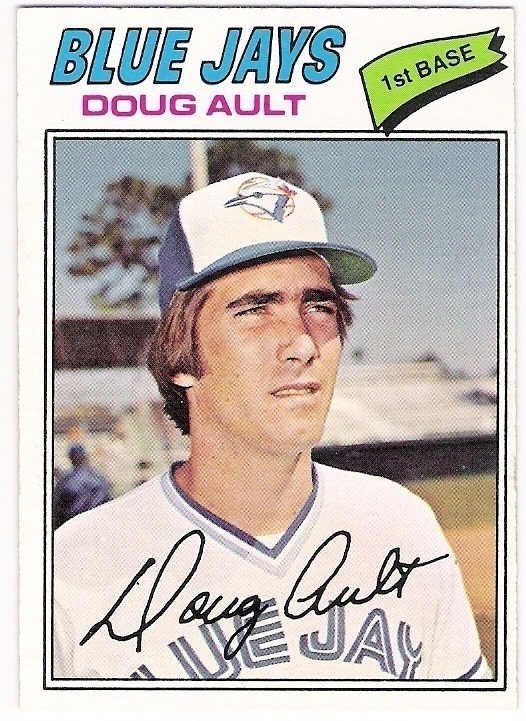 Doug Ault's Opening Day home runs led the Blue Jays to victory in the franchise's first game in 1977. It was a chilly April afternoon 11 years ago when a tall, blond Texan became the toast of Toronto. Snow was falling, and a wicked wind was blowing in from Lake Ontario. Baseball , the summer game, was making its major-league debut in Toronto. The hometown Blue Jays were an expansion team staffed by rejects and retreads scavenged from the other ball clubs. Among the cast of castoffs was an unheralded first baseman. Doug Ault had all of nine games' experience when he walloped two home runs to lead Toronto to a 9-5 victory over Chicago on the club's first opening day. "It was like winning the World Series," Mr. Ault said recently. "I tell you, if it had been snowing all year, I might have hit 50 home runs." He hit only nine more homers that season, and was destined to return shortly to the shadows of obscurity. He was demoted to the minors, retired as a player to become a manager, and last fall was demoted to an even lower level of the minors. When the Jays leave spring training in Florida to play this season's opening game on Monday in Kansas City, Mr. Ault will stay behind to manage the club's Class A farm team in Dunedin. "It's a lot more challenging down here," he said. "Down here in A ball, you have to stress the basics. You repeat yourself a lot. But it's more rewarding, too, when you see a teen-ager you managed making the big leagues in two or three years." 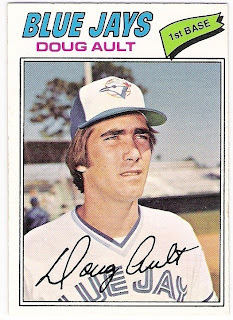 Mr. Ault made the major leagues as a 27-year-old rookie after years of travelling the minor-league circuit. He might have been condemned to a life in the minors had the Jays not taken him as their sixteenth of 30 picks. The Blue Jays were hatched on April 7, 1977, on an Exhibition Stadium field carpeted with snow. Before the game started, Chicago infielder Jack Brohamer used a pair of catcher's shin guards as skis and two bats as poles, and glided in the snow from first base to second. The Jays sold 44,649 tickets to the game, but that many people were never in the stands at the same time. A monumental traffic jam caused many to miss the first pitch (a called strike thrown by Toronto's Bill Singer), while frostbitten thousands fled early. Anne Murray sang the national anthem, fans baptized the stadium by sipping from mickeys, and Mr. Ault jumped on an inside slider in the bottom of the first inning. The ball finally came to a stop in a $2 seat in the sixth row of the left-field bleachers. Mr. Ault so liked the pitches thrown by Chicago's Ken Brett that he swung at an outside fastball in the third inning, this time sending it over the right-field fence. "I remember the fans were waiting on something to happen," Mr. Ault said. "I hit that first one and it just kind of got them going. All of a sudden it was like it wasn't cold at all, like we were in Florida and it was 80 degrees out and we were going to win our first baseball game." Mr. Ault was not the only hero in the messy barn-burner of a game. Right-handed pitcher Jerry Johnson was credited with the win in relief of Mr. Singer, who when he left the field was cheered despite surrendering a generous supply of hits (11) and runs (4) to the visitors. Fortunately for the home side, Chicago was just as solicitous. They stranded 19 of their own baserunners and allowed the Jays 16 hits, including two singles by Vancouver-born third baseman Dave McKay and a pinch-hit homer by Al Woods in his first major league at bat. When the snow had cleared, Toronto was victorious. The fans who had opened the game chanting "We want beer!" ended it with the cry, "We're No. 1!" For one day, they were. But the Jays lost 107 games that season to go with only 54 wins. "The other 161 games were anti-climactic," former team president Peter Bavasi (now president of a sports-news information service in New York) says today. "The first one was definitely something special." Making the big leagues is never easy, and Mr. Ault's journey was more arduous than most. Despite hitting a spectacular .473 to lead all college players in 1972, he was ignored by scouts. He was a contact-hitter satisfied with singles playing a position where scouts expected homers. He hit right-handed and threw left-handed, another oddity. "I was a weirdo, no doubt about it," he says. "Certainly didn't make things easier for myself." He ended up playing for the Glacier Pilots of Anchorage, Alaska (where he once saw the sun set and rise during a lengthy double-header), and later took the field for teams in Gastonia, N.C.; Pittsfield, Mass. ; Spokane, Wash.; and Mexico City. In the off-season he worked as an itinerant roughneck on oil wells in the North Sea and in Louisiana. Eleven years after his heroics, Mr. Ault is still asked by fans about what he acknowledges was the greatest day of his career. Of course it was not such a great day for the pitcher he made a patsy of, Ken Brett. "I don't think he was too happy with me," Mr. Ault said. "I remember playing first base that day, and I could hear him yelling at me from the bench: 'You got lucky!' It was opening day and I guess he wanted to win. But he gave me his best stuff and I hit it." Years later, the hapless hurler was still bothered by the homers. "I made a hero out of him," Mr. Brett once said. "For one day at least, I made him the toast of Toronto." Doug Ault died of a self-inflicted gunshot wound on Dec. 22, 2004.